While the Bible Belt of the South and parts of the Midwest has traditionally been the center of public piety in the US, events of the past few years have shown that no area of the country is really free of it anymore. They’re everywhere, folks, as my most recently published letter-to-the-editor here in Maine attests. Read it and weep. "Blatant, insensitive and unlawful religious favoritism." I have just finished reading “A Call to Prayer for Maine,” a document recently drawn up by the Maine Legislative Prayer Caucus which formalizes that organization and calls Mainers to prayer (see the last page of http://ffrf.org/uploads/legal/MainePrayerCaucusProclamation.pdf). Members include Governor LePage, the Speaker of the House, the Senate President, and over two dozen other Maine State Legislators. The insensitivity and blatant disrespect of our nation’s Constitution inherent in that document is absolutely astounding! The First Amendment to the United States Constitution is part of the Bill of Rights. That amendment prohibits governments from entanglement with or promotion of religion, and from impeding the free exercise of religion (outside of government). Just last year, U.S. District Judge Barbara Crabb ruled the National Prayer Day unconstitutional, saying the Day amounts to a call for religious action by the government and, since the act of prayer is a religious practice, government is barred from encouraging or discouraging such behavior. These Maine lawmakers are almost certainly aware of this; it appears they simply chose to ignore the wisdom of the Constitution and the court. This public display of piety by our lawmakers, in the face of the law of the land, shows a disturbing lack of respect for our secular government. This Call to Prayer document is not only exclusionary but insulting to hundreds of thousands of Maine citizens. 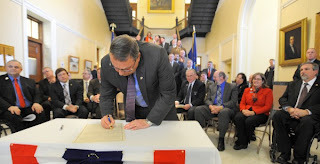 At one point, in quoting Joshua Chamberlain, a one-time Maine Governor and Civil War hero, the document reads, “This is the mystery of Christ . . .” This is a clear reference to Christianity as the favored religion of this official government caucus. This kind of language implies that all those citizens of other religions, or no religion - all the Muslims, Jews, Hindus, Wiccans, pagans, atheists, agnostics, etc. - are less important to these government officials. And this is precisely why the US Constitution’s First Amendment prohibits government entanglement in religion, as a way to ensure that all citizens are considered equal in the eyes of the government and the law. These lawmakers need to be reminded that we sent them to Augusta to make and revise laws, not to preach to us about prayer and use their official status and our tax dollars to promote THEIR religion. The obvious implications of this statement are that without religion our society would collapse, and people who don’t pray (and perhaps all those who aren’t Christian) are “value-neutral and amoral.” This is grossly insulting nonsense! I don’t pray, but my values are essentially the same as 99% of the population of this state. I don’t pray because I don’t believe in supernatural beings. This says absolutely nothing about my values or morals, or my care and concern for my fellow humans. The Call to Prayer document and the Legislative Prayer Caucus are insults to all non-Christian citizens of Maine. I am appalled and outraged that my taxes are being used to support such blatant, insensitive and unlawful religious favoritism.